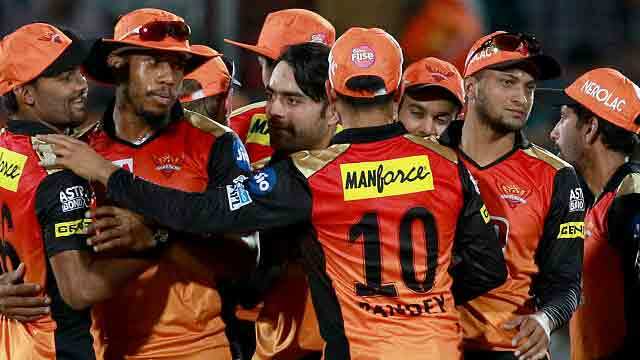 Dhaka, May 8 (Just News): Table toppers Sunrisers Hyderabad produced yet another spirited bowling effort after skipper Kane Williamson's crucial half-century to beat Royal Challengers Bangalore by five runs and virtually assure themselves a place in the play-offs of the Indian Premier League yesterday. Sent into bat, Hyderabad managed a modest 146 but came back strongly after the break riding on yet another gutsy bowling display to restrict Bangalore to 141 for six. Hyderabad's Shakib Al Hasan had a good outing with the bat, posting the second-highest innings score with a 32-ball 35 with the help of five boundaries before being caught at backward square leg off Tim Southee in the 18th over. He was also instrumental in fishing Hyderabad out of trouble as, coming in at 48 for three, he built a 64-run fourth-wicket partnership with skipper Kane Williamson (56 off 39) that proved crucial. Although expensive with the ball as his four overs were taken for 36 runs, Shakib's two wickets included the prized scalp of Bangalore captain Virat Kohli, who got a leading edge off the left-arm spinner and was caught at short third man for 39 in the 10th over. By virtue of this win, Hyderabad have consolidated their position at the top of the table with 16 points from 10 games. Bangalore, on the other hand, are standing on the verge of elimination with just six points from 10 matches. Besides needing to win their remaining four games, Bangalore's fortune will also depend on the outcome of other matches. Chasing the modest target, Parthiv Patel got RCB off to a brisk start scoring 20 off 13 balls before Shakib Al Hasan caught him plumb in front of the wicket. Bangalore needed 19 runs off the last two overs but Siddharth Kaul and Bhuvneshwar Kumar came up with superb death bowling display to concede just 14 runs and seal yet another win for their side. Result: Sunrisers Hyderabad won by 5 runs.